Mill states that it is not a crime to harm oneself as long as the person doing so is not harming others. He favors the harm principle: "The only purpose for which power can be rightfully exercised over any member of a civilized community, against his will, is to prevent harm to others." 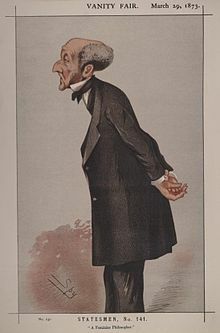 Mill excuses those who are "incapable of self-government" from this principle, such as young children or those living in "backward states of society". ^ Ralph Raico (27 January 2018). Mises Institute (ed.). 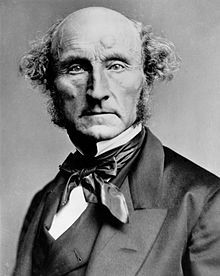 "John Stuart Mill and the New Liberalism". ^ a b Macleod, Christopher (14 November 2017). Zalta, Edward N. (ed.). The Stanford Encyclopedia of Philosophy. Metaphysics Research Lab, Stanford University – via Stanford Encyclopedia of Philosophy. ^ Klausen, Jimmy Casas (7 January 2016). "Violence and Epistemology J. S. Mill's Indians after the "Mutiny"". Political Research Quarterly. 69: 96–107. doi:10.1177/1065912915623379. ISSN 1065-9129. ^ Harris, Abram L. (1 January 1964). 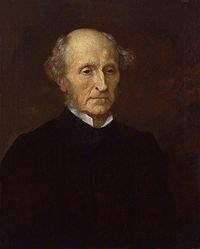 "John Stuart Mill: Servant of the East India Company". The Canadian Journal of Economics and Political Science. 30 (2): 185–202. doi:10.2307/139555. JSTOR 139555. ^ On Liberty by John Stuart Mill. 10 January 2011 – via www.gutenberg.org. ^ a b "I. Introductory. Mill, John Stuart. 1869. On Liberty". www.bartleby.com. Retrieved 16 July 2018. ^ Mill, John Stuart (2005), "The subjection of women", in Cudd, Ann E.; Andreasen, Robin O. (eds. ), Feminist theory: a philosophical anthology, Oxford, UK; Malden, Massachusetts: Blackwell Publishing, pp. 17–26, ISBN 978-1405116619. ^ West, Henry R. (13 September 2015). 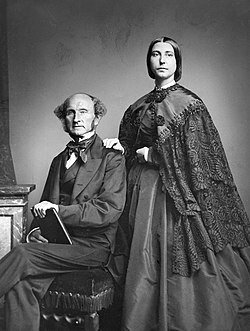 "J. S. Mill". In Crisp, Roger (ed.). The Oxford handbook of the history of ethics. Oxford. p. 528. ISBN 9780198744405. OCLC 907652431. 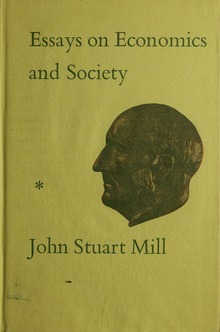 Mill, John Stuart (1981). "Autobiography". In Robson, John (ed.). Collected Works, volume XXXI. University of Toronto Press. ISBN 978-0710007186. Macleod, Christopher. "John Stuart Mill". In Zalta, Edward N. (ed.). Stanford Encyclopedia of Philosophy.